Iraqis Roar as Officials Drag Ramsey Clark From Court! They had to drag Bush-hating democrat Ramsey Clark from court today as Iraqis cheered. 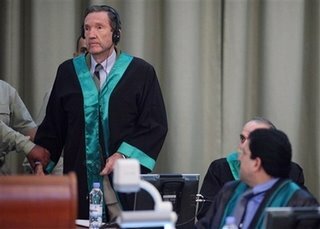 BAGHDAD, Nov 5 (Reuters) – The judge presiding over the trial of Saddam Hussein and seven others on charges of crimes against humanity ejected former U.S. attorney general Ramsey Clark from the court on Sunday for insulting the tribunal. Clark, who heads an international team of lawyers involved in the defence, was ejected at the start of a hearing at which Saddam and two aides were convicted and sentenced to death. The judge, Raouf Abdul Rahman, ejected Clark because he had sent a memo to Abdul Rahman including the accusation that the tribunal was making “a mockery of justice”. “You come from America and ridicule the Iraqi people,” he said. Poor Ramsey doesn’t earn any brownie points for defending the Butcher of Baghdad. Earlier in the press conference after the verdict, Iraqi officials said they will take further action against Ramsey Clark. Saddam Verdict is Announced – DEATH BY HANGING!